Australian native foods are possibly the oldest unchanged foods in the world. They are truly as nature intended! The sweet is sweeter, the sour is sourer and there is natural bitterness and spice heat that can shock the taste buds. 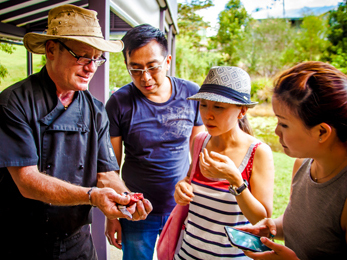 Discover the intriguing world of Bush Tucker with our local bush food expert as you taste, touch and smell the seasonal bush tucker, found in some of the lesser known rural areas of the Sunshine Coast hinterland. Discover their healing properties and their importance in Australian indigenous culture. On arrival you are met and greeted by our informative Live It Tours guide. Discover the stories of times past in the historic township of Eumundi, the meaning of its indigenous name and how Eumundi markets have evolved into Australia’s premier market with local artisans, chefs and producers selling their locally made handcrafted wares. After a very short stroll you arrive ready for Bush Tucker Secrets and introduced to our local bush food expert. Discover the surprising tastes and bursting flavours of native Australian bush foods and learn how they are possibly the oldest unchanged foods in the world. Find out about the plentiful bush food plants, found in the lesser known rural areas of the Sunshine Coast as you taste, touch and smell a variety of seasonal bush foods. Feed your curiosity as you participate in a fun and informative bush food blind tasting with the guidance of our bush food expert. Be surprised by their distinctive flavours – the sweet is sweeter, the sour is sourer and some delightfully shock the taste buds! Learn about their extraordinary healing properties and the importance they play in indigenous Australian culture. Our first public departure is on Wednesday, the 05th of April at 10:00am and will run every Wednesday from then on.